My 2 year old niece gets so excited when she sees the ice cream truck that her mom decided to have an ice cream truck cake for her birthday. I looked on this site and online to try and find pictures, but there aren’t many available. Therefore, I decided to submit my first cake to this site. The 1/2 sheet cake was strawberry. The ice cream truck is simply white cake. I baked it in a 9 x 13 pan and after refrigerating the cake, I cut 2 equal squares for the back of the truck. I used the rounded corners of the cake and iced them together for the bumper and hood. I, then used a rectangle and iced it to the truck and trimmed it into a triangular shape for the windshield. The wheels are donettes with piped icing covered in sprinkles. The ice cream is pieces of the white cake left over stuffed into the cone and covered in icing. 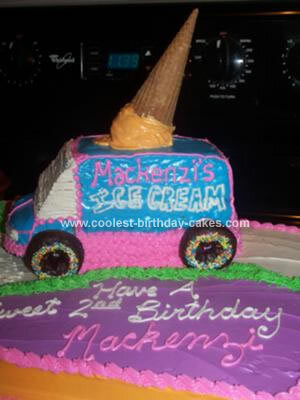 It was such a fun cake to do and my niece loved having her own ice cream truck to eat.